This new frontier of sportfishing midway along WA’s rugged coast offers exciting and varied angling opportunities for the adventurous fisho. JIM HARNWELL reports. SURROUNDED by endless miles of red desert sand, low scrub and the deep indigo blue of the Indian Ocean, the fishing town of Exmouth, perched midway along WA’s vast and rugged coastline, is fast garnering a must-visit reputation amongst keen sportfishermen. The species on offer, the variety of habitats and the proximity of the spectacular Ningaloo Reef combine to make this a place any serious fisho should do his/her level best to get to. It’s no secret that Exmouth is best known for its gamefishing – it’s got some amazing marlin grounds with big blues and blacks, plus sailfish and more than a few swordfish, being regular captures. The annual Gamex tournament, which is run by the Exmouth Game Fishing Club, is lauded as one of the premier bluewater events in the southern hemisphere. The 2012 Gamex tourney was held over March 10-17. 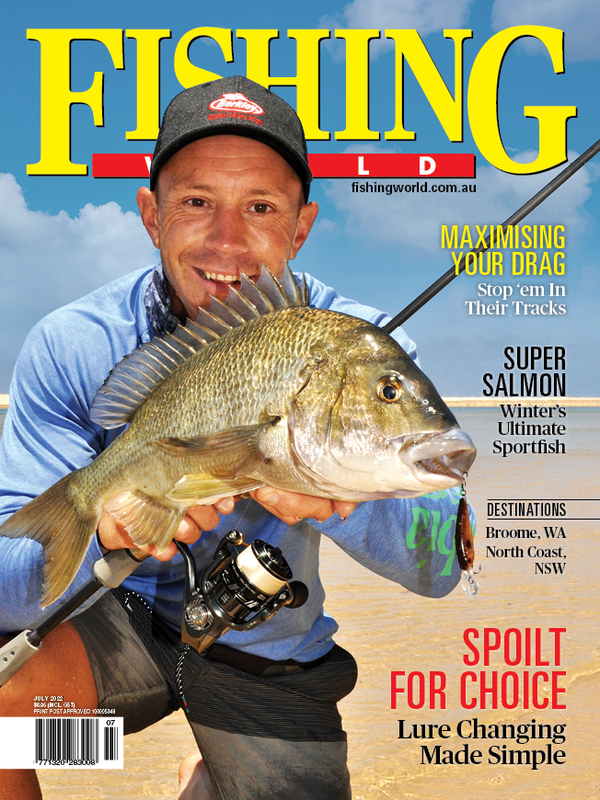 Check out egfc.com.au for details about the 2013 event and for catch results from this year’s comp. More recently, however, Exmouth has begun to develop an international reputation for inshore sport and fly fishing for species as diverse as bonefish, queenies, giant herring, trevally and permit. Former Tasmanian trout guide Brett Wolf opened up Australia’s first mainland bonefish fishery at Exmouth several years back with his operation True Blue Bones (www.truebluebonefish.com.au) and I understand at least one other inshore sportfishing operation is now offering anglers the chance to tangle with Exmouth’s resident light tackle inshore sportfish. Add to all this all the usual suspects including a variety of reef fish plus mahi mahi, tuna, mackerel, billfish, wahoo and even southern species like snapper and you have a really productive and interesting fishery. My recent trip involved a week fishing the eastern side of the massive Exmouth Gulf with Halco’s Neil and Ben Patrick, Halco marketing manager Tim “Biggles” Carter and Singaporean tackle distributor and angler Poh Beng Seng. Ben had earlier motored his immaculately restored 48 foot West Coaster Mandalay up from Perth ­­– a 1300km run from Fremantle – and moored up in Exmouth’s huge new marina for the season. Neil, Poh and I flew in from Perth just as Ben and Tim finished loading the last lot of provisions for the trip. As soon as the tenders (Ben’s 5m tiller steer Haines Hunter and a borrowed tinny that became known as “The Pig”) were rigged up on a tow line astern, we were underway and steaming east across the gulf, chased by the setting sun. This waterway is enormous – inspection on a map or chart doesn’t really prepare you for how big the gulf actually is. The trip across to our anchorage would take about 21/2 hours, Ben said after consulting his state-of-the-art GPS system, and so we spent what remained of the afternoon sitting in the flybridge sipping cold beers and watching a procession of humpback whales breaching and tail slapping. At one stage we were completely surrounded by frolicking whales ranging from great black behemoths to newly born calves. An amazing sight. The seas were calm, a balmy breeze ruffled the water, I was on a magnificent boat with good mates in one of the fishiest places in the world. You wouldn’t be dead for quids! We arrived at our anchorage – in one of the few deep-water creeks on the eastern side of the gulf – late in the day. Our “guides” – local fishos Ben Knight and Harry Butler – met us out the front of the creek and steered us in via a narrow and meandering channel before tying off their big plate centre console and hopping aboard Mandalay for a welcome beer. Ben works in Exmouth’s premier tackle store, Blue Water Exmouth, and doubles as a fly fishing guide for Brett Wolf. Harry Butler – not the Harry Butler but by jeez he looks like him – also works as a guide and boat operator for the only lodge on the eastern side of the gulf, the aptly named Wilderness Island Lodge. During our four days of mothershipping on the eastern side of the gulf we enjoyed good action on trevally, coral trout, jacks, queenies, mackerel and plenty of high-flying giant herring. The flats systems here have to be seen to be believed – miles and miles of clear, sandy shallows interspersed with creeks, clumps of mangroves and rocky islands. These flats – which have been described by fly-fishing authority Peter Morse as being “the best” in Australia – provide almost limitless opportunities for adventurous sportfishermen. These waters are fundamentally untouched. You can really only access the best flats systems by boat – we did it in style aboard Mandalay – and apart from guests at the Wilderness Island Lodge and a few adventurous local anglers like Ben Knight who make quick forays across from town, the resident fish rarely, if ever, see a hook or lure. The local mud crabs have a pretty free and easy life as well, as evidenced by the fact that Ben and Tim produced enough for dinner or entree most nights simply by walking around the creek banks and catching them by hand. A dilly put over the side of Mandalay when we were drinking and yarning on the back deck of an evening produced regular feeds of succulent blue manna crabs as well. We generally fished the flats early, depending on the tide, and then headed out into the gulf proper to fish a few of Harry’s favourite reefs and shoals and bommies for trevally. Metal jigs and Roosta poppers proved dynamite on the resident goldies and brassies. A location we returned to on several occasions was a low sandy cay surrounded by shallow reef. As the tide rose, the flats and reefy areas became staging areas for assaults on our lures by hordes of giant herring as well as trevally and queenies. The herring were fantastic fun, providing the usual mad aerial antics and making the drags on our light spin outfits really scream. Silver and gold Twisties in the 10, 15 and 20 gram sizes were more than effective on these high-flying sportfish, although staying connected was challenging. Tim and Neil dominated the giant herring catch, with some fantastic fish that pulled hard and jumped high in the clear, shallow water. The herring, along with what seemed to be a resident school of queenies, provided plenty of fun in the afternoons, when the easterly breeze died away and the entire gulf slicked out. The eastern gulf fishery is largely dominated by trevallies and queenfish around the flats (large schools of permit have also been spotted working the shallows) and demersal species like coral trout, various emperors and yet more (and usually much bigger) trevally out on the deeper reefs and shoals. At certain times of the year, cobia, mackerel, tuna and even sailfish can be targeted in the gulf, especially down towards the mouth. Some pretty big snapper get caught around this area as well. Harry took us on a longish run north one day to check out the lodge, which he and his mate Jim Alston built in 2005. Before we reached the lodge proper we fished a long section of coast that featured rugged red cliffs dropping straight into clear gulf water. This was a mangrove jack hotspot able to be fished either from shore or from boat. Plenty of cod, as well as trevally and queenies, were in residence along with the jacks. Later in the season the jacks average around three kilos, Harry told me, and you need to have luck on your side to extract them from their rocky homes. Various divers from the Halco stable all worked well on the local jacks and cod when cast around, into and along the rocky caves and bommies out from the cliff edge. As well as offering killer views, combined with the feeling of total escapism that’s unique to top class wilderness operations, the lodge provides access to outstanding sportfishing. Harry told me that big golden trevally, acres of queenies and even longtail tuna can be caught on fly or spin gear off the nearby sandy beaches. A big longtail off the beach? How good would that be! For more on this unique location, check out a comprehensive website, which includes some great video clips of Harry in action, at www.wildernessisland.com.au. All too soon, we had to return across the gulf to Exmouth so I could make a start on my long journey back east. Before I left, however, I was pretty keen to get at least a taste of the bluewater action I’d heard so much about. Ben Knight very kindly organised a quick trip for me with local sportfishing guide Josh Bruynzeel of Onstrike Charters (www.onstrike.com.au). Josh picked me up at the marina in his 8m Fury centre console and we headed out into the gulf and then around into the open ocean. First up we threw poppers for mackerel and as the sun rose a bit higher we then moved further out and started trolling skipping gars for a marlin. We had one black of about 80 kilos shadow our baits as we worked them around seething masses of striped tuna. But the billfish was too focused on all the other bait around to eat ours. We made do with a double hook up on a pair of nice dollies before Josh had to point the nose of his immaculate vessel towards port so I could catch a flight back east. Josh is one of the more meticulous charter skippers I’ve fished with and runs a well-organised and highly efficient boat. He was a merchant banker before giving away the corporate life to become a fishing guide. Obviously a bloke with the right priorities in life … His boat, powered by twin 150hp Mercury Verados, is an absolute weapon – find out more about these top-of-the-line custom built WA vessels at furycustomboats.com.au – with the latest Simrad NSE electronics and a well set up cockpit made for active sport and game fishing. AFTER only a few days of fishing, I can’t hope to offer any sort of definitive guide to Exmouth – it’s the sort of place that would probably take a lifetime to unravel. I was lucky to get the chance, courtesy of the Halco boys, to spend time with locals like Harry Butler and Ben Knight. These fellas, together with other guides like Josh Bruynzeel and Brett Wolf, know their stuff and helped open my eyes to what Exmouth is all about. As a result of that inside knowledge, I can tell you that Exmouth is well worth visiting. It’s a unique location and the varied fishing opportunities make it an exciting destination for any angler, whether you’re a hard-core gamefisherman, a dedicated SWF exponent or just a light tackle junkie like me. It’s remote – you’re talking a 13-hour drive from Perth – and flights are limited and not cheap. If you’re based over east it may as well be in another country. Yet I know quite a few east coast anglers who have made the big trip west towing a boat in order to base themselves out of Exmouth for a few months in order to experience the fishing adventure of a lifetime. All the reports are that the enormous drive, not to mention the logistical nightmares, are well worth it. When it comes to actually staying in Exmouth, as well as the usual motels and rental options, there are some really good camping areas within the Cape Range National Park, which is located east of the main township. Check out exmouthwa.com.au for full tourism details. Many of these camping sites are close to the water. I’ve heard quite a few tales of anglers catching bones, big trout, trevally and so on while casting small lures or plastics off the beach near some of the more popular campgrounds. A decent kayak or boat opens up the reef and a more seaworthy vessel means you can access the amazing gamefishing action that Exmouth is renowned for. And if you can’t be bothered taking your own boat – let’s face it, it’s a freaking loonng tow – then the guides mentioned in the main piece, along with plenty of others you can no doubt find yourself, have the place wired. And there’s always the Wilderness Island Lodge with those rampaging queenies and goldies, not to mention the longtails cruising the beach, as well … Personally speaking, I’d love to tow the Fisho Bar Crusher over for an extended sportfishing adventure. That would open up the eastern gulf as well as the offshore options to the west … a week or two at the lodge, a few camp outs, a few nights of luxury in a motel and do it all again until the long service pay runs out and I have to drive 5000kms back home. Sounds very tempting … The downside of Exmouth – and there are always downsides to any fishing destination – is that it is well known as being extremely windy – in fact, the strongest ever wind gust recorded on the Australian mainland was at Exmouth. That was in a cyclone which clocked in at 267kph. Outside of cyclone season, you get the dreaded easterlies and south-easterlies. The least windy times are April and May, according to Halco’s Tim Carter, who’s fished Exmouth on many occasions. Exmouth also gets pretty warm in summer, although when I visited in spring, conditions were surprisingly cool. The town itself seems a pleasant enough place with all the amenities you’d expect in a smallish regional centre. Quite a bit of development is going on around the marina area with some pretty nice houses being built up along the canals and wharves. I understand the cost of living in town is quite high as most supplies have to be brought in from larger centres further south. But there are supermarkets and all the usual retail outlets, plus decent restaurants and bars. And I have it on good authority that your all-important tackle requirements will be well met via the friendly staff at Blue Water Exmouth (08 9949 1315, exmouth@bluewater.net.au). When you’re not fishing, the snorkelling and diving on the reef is world class, there’s some fantastic surfing, great beaches and outstanding bushwalks. But why would you not be fishing?